President Dilma Rousseff's visit to the United States from June 28 to July 1 produced a striking improvement in the atmosphere of a relationship marred until recently by mutual suspicion and recrimination. It could eventually help Rousseff improve her poor standing at home, assuming she survives growing pressures from adversaries and supposed allies who now speculate publicly about her resignation or impeachment. "I will not be removed [from the presidency]," said the president days after returning from the US in an interview to daily Folha de São Paulo in which she acknowledged the pressures. She vowed to fight "tooth and nail" to preserve her mandate and disprove allegations of mismanagement of federal accounts and violation of campaign finance rules in her 2014 reelection campaign. From a Brazilian perspective, the underlying message of the visit was that a results-oriented engagement with the United States seen as a problem and avoided in Brasilia after the Workers Party (PT) came to power, in 2003 is now viewed in the government as part of the solution to the economic crisis the country got itself into. Good vibes aside, proximity with the US is likely to remain a source of significant ambivalence among Brazilians and a challenge for politicians and businessmen invested in closer ties. According to a telephone survey conducted while Rousseff was in the US by the polling firm Idéia Inteligência, with 20,033 voters in 64 cities, an overwhelming majority of 73%, would applaud the lifting of the tourist visa requirements for Brazilians to travel to the US. More than half, or 55%, said that closer ties with the US would help improve both the quantity and quality of consumer products they buy. At the same time, however, a majority, or 52%, said that a closer relationship would benefit more American than Brazilian workers. 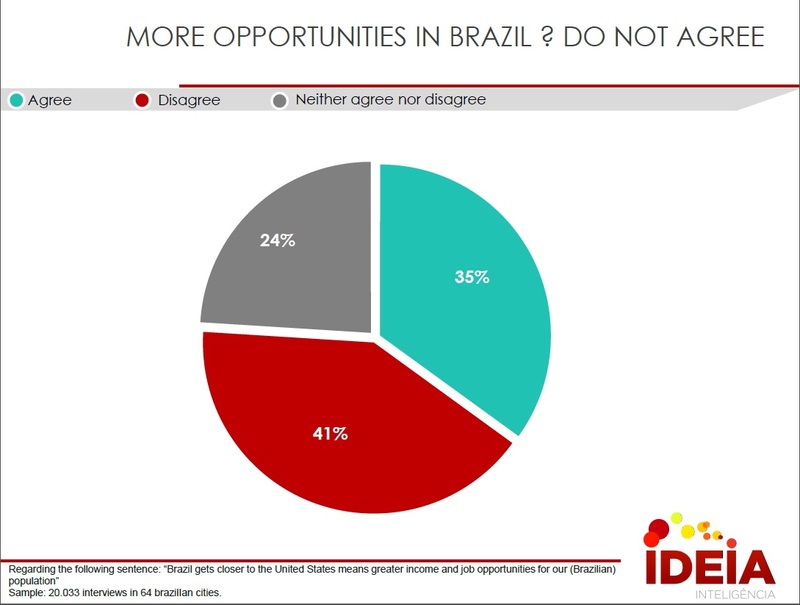 Only 35% agreed that greater proximity would generate more income and jobs for Brazilians, while 41% disagreed. Voters surveyed were more evenly divided on the impact of closer ties with the US on unemployment in Brazil. Still, 38% agreed and 36% disagreed that in such scenario unemployment would go up among Brazilians. "Brazilians clearly see the US as winners of a greater economic integration but fully appreciate consumption of American goods and traveling without visa to the US," said pollster Maurício Moura, Director of Ideia Inteligencia, who conducted the survey prepared in collaboration with economist Monica de Bolle. "President Dilma would have hit a home run had she managed to convince Washington to include Brazil in the US visa waiver program, helping increase her very low popularity at the moment." Moura cautioned, however, that while Brazilians acknowledge the benefits of greater consumption and travel to the US that would come from closer ties with the US, most view international trade as a game of winners and losers in which they are more likely to lose than to win. Assuming the visit has opened the way for a better dialogue between the two countries, the survey shows that it will be very challenging for policy makers in Brazil to balance the public's expectations on US-Brazil relations, particularly in the poisonous political environment that now prevails. Free trade agreement, "an aspiration"
Policy ideas to liberalize and improve the quality of the famously closed Brazilian economy, making it more efficient and competitive, permeated the conversations Rousseff and members of her cabinet had with business leaders in New York, Washington, D.C., and California. Speaking at a business gathering in New York, Minister of Development, Industry and Commerce, Armando Monteiro, said that the negotiation of a free trade agreement with the United States is "an aspiration" for the medium term. But as the Idéia survey shows, turning aspiration into ambition will require the investment of a political capital that currently does not exist. Part of a welcome new reliance on diplomacy by the once inward looking president Rousseff, her trip to the US was staged with important inputs from Finance Minister Joaquim Levy, and other members of her economic team to produce a vote of confidence from investors and a new influx of capital for infrastructure projects in an increasingly adverse global economic scenario. This is vital to ensure a positive outcome of ongoing efforts by the government to balance fiscal accounts, reverse an inflation rate now headed to at least 9% and put the country back on the path of economic growth. Success will depend, in large measure, on the executive's capacity to manage the political crisis and on factors beyond its control. Top among these is the evolution of investigations under way of CEOs and senior executives of major construction companies, leading politicians and former top employees of Petrobras accused of involvement in a corruption scandal that has cost billions to the state company and fuels the political crisis. The director of the Brazilian Federal Police said in an interview published on July 5 that the investigations will not be affected by political pressure and will take investigators to wherever the facts lead them, "no matter who is hurt." In a gesture filled with a symbolism that has been long absent in the dialogue between the Americas biggest multiracial democracies, the Brazilian leader started her twenty-four hour journey in Washington with a visit to the Martin Luther King Memorial, accompanied by President Barack Obama. The warm welcome she received at the White House could not have been timelier for the embattled Rousseff. As Obama was praising her as a leader he "trusts completely" at a joint press conference held at the end of their talks, on June 30th, an opinion poll released in Brazil showed that 78% of Brazilians had lost confidence in the president and only 9% - down from 12% in April - approved her performance in the second term, started in January. The expected further deterioration of economic conditions in Brazil and the raise of unemployment will make it harder to reverse Rousseff's loss of popular sympathy and political support in Congress. Against these such prospects, Rousseff's visit to Washington did help to move Brazil-US relation forward. From the US point of view, the most important result was a commitment made by both governments to generate 20% of their electricity from renewable sources other than hydropower by 2030. This will require the US to triple and Brazil to double the participation of renewables in their electricity generation matrix in the next fifteen years. The commitment put Brazil and the US on a converging path to the UN Climate Change conference scheduled for December, and led Obama to praise Brazil's as "a global power". The visit helped to produce a few, modest agreements on military and security cooperation that had been pending in the Brazilian Congress for years. The two countries opened their beef markets, now dominated by the same company - Brazilian JBS. Initiatives to facilitate commerce and travel were included in a one hundred and twenty long list of progress achieved. The day after returning from the visit to the US, Rousseff made another decision that was well-receives in Washington. Brazil voted for the adoption by UN Human Rights Council of a resolution condemning the government of Syria human rights violations. While insisting on a political solution for the conflict, the Brazilian government stated that the Syrian authorities have "the primary responsibility to guarantee the human rights of the Syrian people." It was a substantive change from the abstention posture the country had maintained in previous votes on Syria. The uncertainties created by the complex crisis facing Brazil, which now includes the president's own political longevity, makes it harder to assess the long term impact of the visit.